Find hotel near Melaka Wonderland Theme P ..
Theme parks are the latest fad and fascinate children to a large extent. This is a water theme park which has high speed water slides, wave pool, Adventure Island and almost 16 attractions you can look forward to. What you will like the most is the trip to the natural forest through the premises of the park. Your children will have lots of fun taking the water slides and splashing water. The eatery offers decent menu options to satiate your hunger. Most importantly, do not forget to take the souvenirs from the lovely shop as a beautiful memory form the theme park. Personalize your visit to the city by chalking out a plan using Ayer Keroh trip planner. Add accommodation and hotels in Ayer Keroh that suit your budget including the most recommended ones like Hotel Sentral Melaka, Kings Hotel Melaka and Ibis Melaka. Chalk out the best way to discover the city with Ayer Keroh vacation packages. Check out various modes for how to reach Ayer Keroh. Love this? Explore the entire list of places to visit in Ayer Keroh before you plan your trip. Fancy a good night's sleep after a tiring day? Check out where to stay in Ayer Keroh and book an accommodation of your choice. 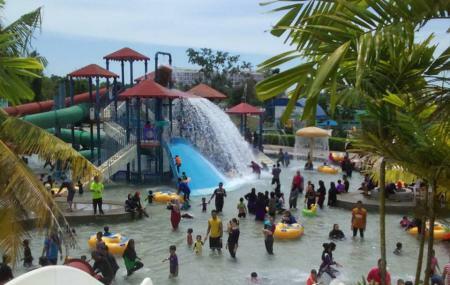 How popular is Melaka Wonderland Theme Park And Resort? People normally club together Malacca Zoo and Laman Tiga Budaya, Taman Tema Air while planning their visit to Melaka Wonderland Theme Park And Resort. Entrance fees are too expensive. Rules are too strict. Can not tolerate. Visitors are getting reduced. The arrogant staff. Vehicle to bring visitors from the entrance to the pool area is gone. Far to walk. Will not be there again. Affordable theme park and pleasant staffs, well maintained. Suitable for kids and adults. Foods are okay, combo rice come with drink. Parking per entry is RM5, locker rental is RM25 + RM5 deposit. Toilet for ladies needs improvement as there are shower room without doors, they replaced it with curtain which some people didn't noticed there is people shower in the room and there is no hanger to hang our bag or clothes. It was nice but if you are looking for a good place to have a holiday in Melaka, I would recommend A'Famosa resort because it has more choices of slides. They will charge for any miscellaneous section. (Buggy ride - 2 bucks per person, car parking, etc). Not a big fan of the facilities. No shade area, not well maintain. Unfriendly staff. Not old-age friendly and I pressume OKU as well. There’s better option that offers way better experience compare to wonderland franchise. Do expect burn feet as the way to any of the ride is on tar road. If you wear slipper you will have to take it off before getting on the ride, so doesn’t really make sense to wear slipper in the first place. The changing room has no lock, no sitting area. Overall its a bit pricey and not really worth it. Had a great time here. Helpful staff. Great facilities. But the water was a bit murky. And do walk around with slippers. The road will be scorching hot and your feet will burn. Tip: Buy the entrance tickets via Fave, it'll save you some cash.